The Reserve Bank of Australia (RBA) sure knows how to get the party started! In its policy statement earlier today, the central bank surprised the markets even as it kept its interest rates steady for another month. What’s up with that?! As many had expected, the RBA kept its interest rates at 1.50% for a seventh month in a row in April. For trading newbies out there, you should know that market players have been crying “bubble!” over Australia’s housing market lately. The combination of low interest rates, Australia’s tax codes, the structure of its mortgage broking industry, and “brisk” increases in house prices have led to both potential home-owners and owner-investors to prefer “interest-only” housing loans over other plans. This trend is problematic for those who are vulnerable to “payment shock” (read: homeowners whose wages aren’t rising) at the end of their interest-only term. Fortunately, the Australian Prudential Regulation Authority (APRA) and the Australian Securities and Investments Commission (ASIC) have paid attention. Just last week, APRA told all banks to cap the annual growth of investor mortgages to 10% AND limit their new interest-only lending to 30% of total new residential mortgage lending. For reference, interest-only loans currently make up about 40% of all mortgages, with all four major banks well over the 30% limit. APRA also wants banks to screen their borrowers more stringently by only granting interest-only loans to those who have deposited at least 20% of the principal and has a loan-to-value ratio of more than 90%. Meanwhile, ASIC, which handles non-bank lenders, has penalized eight major lenders for poor practices and has promised to exercise its regulatory powers to gather data on interest-only lending flows from large and smaller banks, mutual banks and non-bank lenders. But back to the RBA. The central bank’s text tells us two things. First, it’s pretty dang happy with the recent curbs in housing loans and expects them to reduce the risks associated with high levels of indebtedness. Next, its confidence that lenders will use appropriate metrics for their loans and that the housing market will need to rely less on interest-only loans means that it’s expecting lenders to fall in line and make them happen. The only other major change in this month’s statement is the central bank’s notes on employment. In its March statement, the RBA only noted of the “mixed” nature of labour market indicators. The RBA’s decision to maintain its current policies was widely expected, but its decision to highlight problems in the employment and housing industries was enough to entice currency bears. 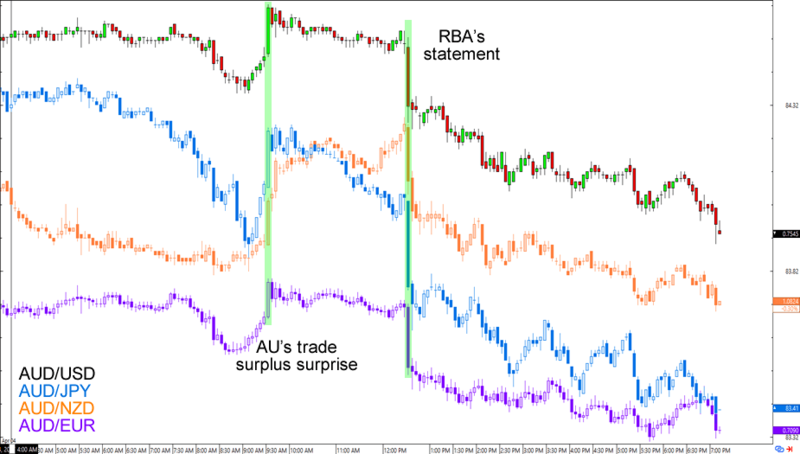 As of writing, AUD/USD is down by 42 pips (-0.55%) for the day at .7563 while AUD/JPY is down by 79 pips (-0.94%) to 83.52 and AUD/NZD is down by another 23 pips (-0.21%) to 1.0835. Recall that part of the Aussie’s charm in the past few months is Governor Lowe’s suggestions that the RBA is done cutting rates for the time being. He hinted that more rate cuts are hardly “in the national interest,” as they encourage more borrowing and more upward pressure on housing prices. But with housing regulatory bodies hard at work on containing new, risky loans, the RBA now has room to address issues such as high unemployment and low inflation by cutting its rates. Will the central bank go back to its rate-cutting ways? Or will they wait for the housing market to cool some more before making their moves? What do you think?